Tuna “Noodle” Lunch | Keep It Up, David! I’m gearing up for a weekend of healthy eating. Are you? You should be. Do it. Sorry – it’s been a long week, that’s all I got in me in terms of a pep talk. 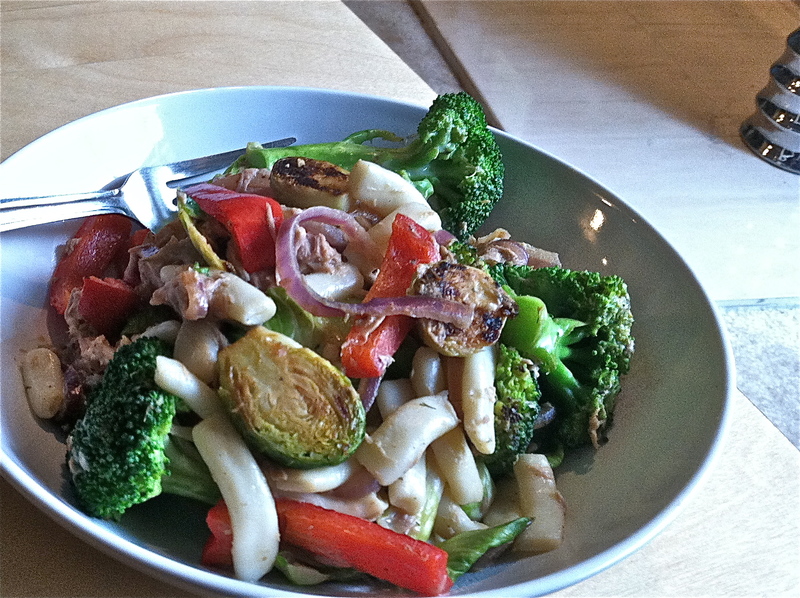 I thought I’d kick off the weekend by sharing one of my healthy meals from earlier this week. To call this a “recipe” would be a stretch, because there was no planning or forethought – I just grabbed what I had and threw something together. It’s actually quite easy to do, and it’s really freeing to putz around a kitchen without being tethered to a recipe. I work without recipes more than I do with them. Of course, working without a recipe means that there’s a chance that the final dish won’t turn out spectacularly, but that’s a risk I’m willing to take. 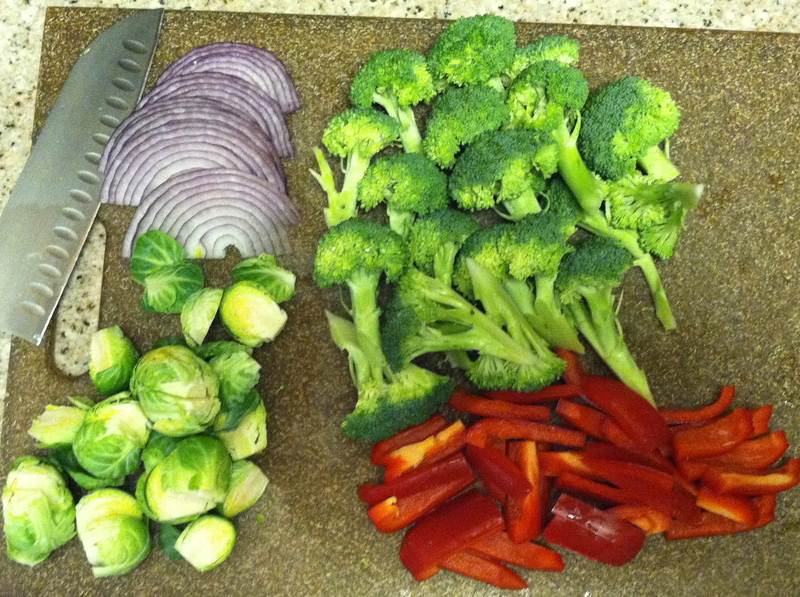 That’s red onion, broccoli, brussel sprouts, and red pepper. I heated my big skillet, slicked it with some non-stick spray, and threw in the veggies so they could start to cook. 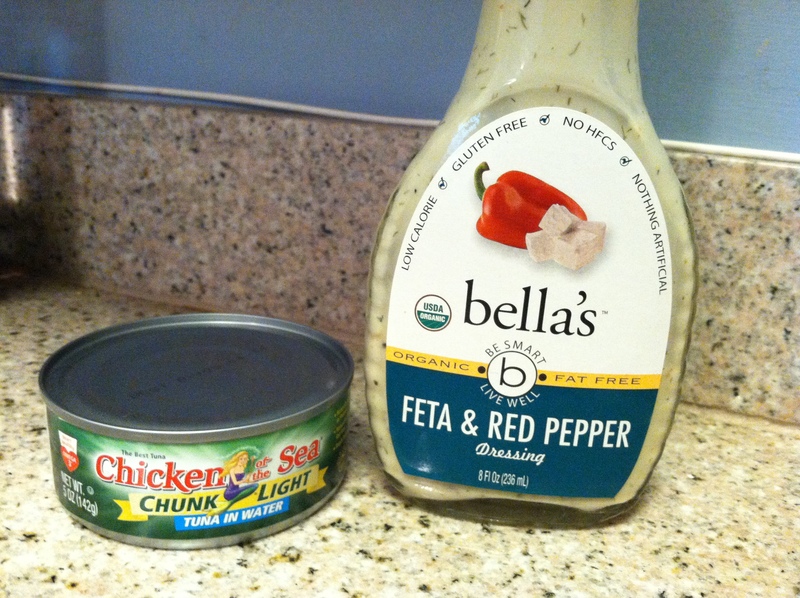 I wanted to add some protein, so I pulled a can of tuna from the cupboard, drained it, and tossed it in there as well. The dish needed a sauce or something, so I pulled from the fridge a salad dressing (I often let salad dressings double as sauces), and this one had red pepper in it, so I knew that would go well with the red pepper I had already chopped up. The bottle was almost empty, so I finished it off. It couldn’t have been more than a 1/4 cup – just enough to coat everything and add flavor without being gloppy. If you were wondering why the word “noodle” in this post’s title is in quotes, it’s because of my final ingredient: tofu noodles. Fake pasta! It’s tofu, shaped and formed to look like pasta. They sell it in different varieties, like spaghetti and angel hair – I actually blogged about the spinach fettuccini kind a few months ago. You’re not going to be fooled into thinking you’re eating actual pasta, but it’s not bad, and reminiscent of asian-style noodles. And it’s a great swap, because that entire bag – which is 2 servings – has 40 calories and is fat-free. You drain it and rinse it, and either heat it in boiling water (like you would cook pasta), or, if you’re like me, you add it to the big skillet in the final minute and let the heat of the other food warm it up. Voila! A delicious, healthy meal! I kinda wish the tuna was in bigger pieces, but that was out of my control, as it came from a can and it broke apart from the stirring. Otherwise, my meal was tasty, and it only took about 15 minutes, from start to finish. Don’t let anyone tell you eating healthy takes time or is too difficult! This entry was posted on Friday, April 20th, 2012 at 9:55 am and is filed under Uncategorized. You can follow any responses to this entry through the RSS 2.0 feed. You can leave a response, or trackback from your own site. Wow! That looks absolutely delicous!!! After seeing your post using baby egglplant, I bought some at Sprouts. Still haven’t decided how I’m going to use it this weekend! This looks delicious!! 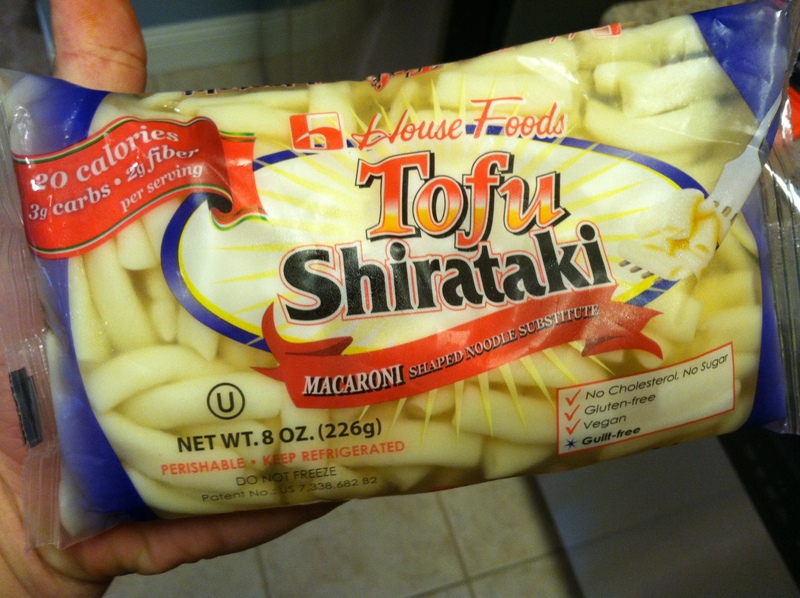 I love those shirataki noodles but have never tried that shape. Thanks for the great meal idea! Hows the texture on those noodles? They’re more like soba or buckwheat noodles than pasta, if that helps. Hve been trying to find a similar product in the UK. So far no luck! Anyone know of this Product?